It had to happen sooner or later. In 1989, the big news was the fall of the Berlin Wall and the complete and utter chaos that followed after the Communist Russian government collapsed. The Klingons of the Star Trek Universe had, for most of their first twenty years of existence, been a stand-in for the Russians. Thus when the Communist Russian government fell, the Klingon government had to follow suit. Several parallels to the current events at the time can be seen. In 1986 a nuclear accident happened at the Chernobyl Nuclear Power Plant. A similar disaster happens on the Klingon moon Praxis. The Klingons in particular have to stand down from their aggressive military stance because their planet is dying as a result of their disaster. Soviet Russia, too, had difficulties which made their own lifestyle as a nation collapse. As I stated previously in my review of StarTrek II: The Wrath of Khan, my favorite Star Trek villain is Ricardo Montalban's portrayal of Khan Noonien Singh, but a close second is Christopher Plummer's portrayal of the renegade Klingon General Chang. The fact that both of these movies were directed by Nicholas Meyer has a lot to do with it. I personally feel that Meyer was able to draw out the story line much better than any of the other directors who attempted it. At the beginning, Hikaru Sulu (George Takei), a former helmsman for the USS Enterprise and now the commander of his own vessel, the USS Excelsior, is on manuevers when they are hit by unexpected shock waves. The shock waves resulted from an explosion on the Klingon moon, Praxis, the site of a key energy production facility for the Klingons. The Klingons initiate a procedure to bring peace between the Federation and the Klingon Empire (because the Klingons can no longer apply the aggressive pressure they had previously exhibited... sounds familiar, doesn't it?) The Klingons send an ambassador to Earth for negotiations, Gorkon (David Warner). He is to be escorted by the Enterprise, which Kirk resents because as he says he has never forgiven them for the death of his son. 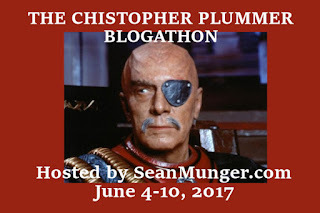 A note from your blogger: In Star Trek III: The Search for Spock, a crew of Klingons led by the villainous Kruge (Christopher Lloyd) had engineered an attack on the Enterprise and its crew. 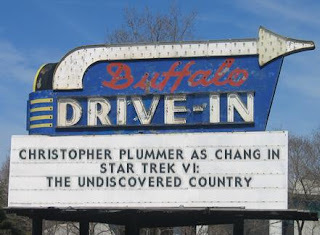 I won't go into more detail; that's for another post, but it must be pointed out that Kirk is not the ideal liberal paragon of virtue that Roddenberry envisioned in this movie. And I totally agree with this idea. After all, Kirk exhibits a xeno-racism by blaming all Klingons for the actions of one, or a group if you accept that all of Kruge's crew were complicit in his actions. 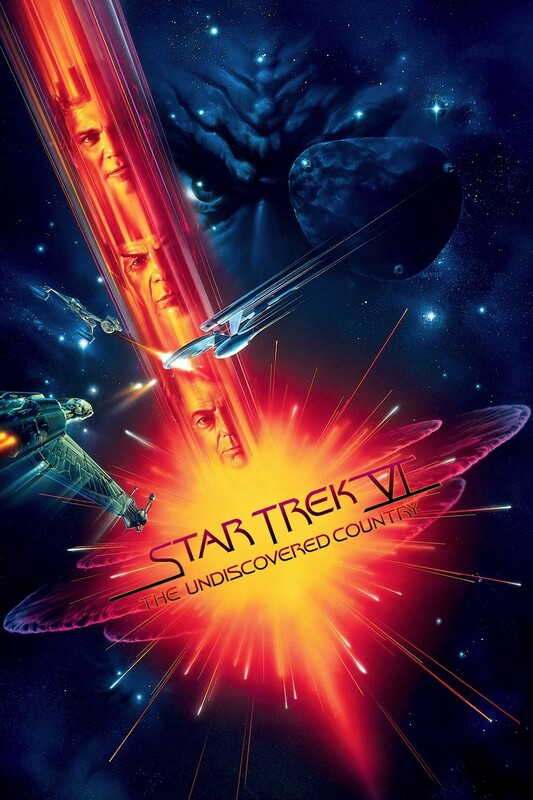 Roddenberry himself made himself a PITA about the fact that his liberal idealistic future had been compromised by some of the xeno-racist things some of the characters say in this film. In fact he had made a petition to the powers that be to stop the release of the movie, but died a few days later, so his petitions were not followed. Gorkon and a few guests, including Gorkon's military guard, Chang (Christopher Plummer) come aboard the Enterprise for a dinner, after which the crew of the Enterprise express some remarks about the way the Klingons composed themselves at the dinner. So obviously Kirk is not alone in his feelings towards the Klingons. That night (there is night in space? ), the Klingon ship is fired upon, ostensibly by the Enterprise, and the ship is damaged and many Klingons either hurt or killed. The Enterprise crew is flabbergasted because they did not fire upon the Klingon ship. Kirk and McCoy beam aboard to render what help they can, but McCoy, being unacquainted with Klingon biology, is unable to help and Gorkon dies. Kirk and McCoy are arrested for the crime of murder by Chang and taken to the Klingon homeworld to stand trial. They are defended eloquently by an unnamed Klingon defense attorney (played by Michael Dorn, and a theory runs through the Star Trek fanbase that he may have been Worf's grandfather, although he is not identified by name in the movie). But the two are convicted and sent to the Klingon equivalent of Siberia. Meanwhile, on the enterprise, Spock and crew try to find out what really happened in the attack on the Klingon ship. To help aid in this they have to ignore or pretend to have communications problems when Starfleet tries to order them back to Starbase. It takes a while but it is soon revealed that there is at least a couple of traitors on board the Enterprise. And they were working in conjunction with Chang, who as it turns out, is the ultimate cold warrior, kind of like General Jack D. Ripper in Dr. Strangelove. Chang just could not face a future with no enemies (in this case Starfleet), and engineered the assassination of his own Klingon ambassador so as to restart the conflict. Plummer has the neatest look of any Klingon ecer portrayed on film, too. That's him in the banner at the head of this entry. Who wouldn't want to go hang out at the bar with a cat who looks that menacing? You could keep all the riff-raff away with just his look. I haven't seen a whole hell of a lot of Plummer movies, mostly as the star or one of the stars of a few war movies. (The Night of the Generals, Battle of Britain, Aces High, Waterloo). I always enjoy him when he makes an appearance on screen though. He is one of those few men that I think I could fall for if I had been born a woman, even in his older age. Hope you enjoyed the tribute this time, kiddies. Time to fire up the nacelles and head home. 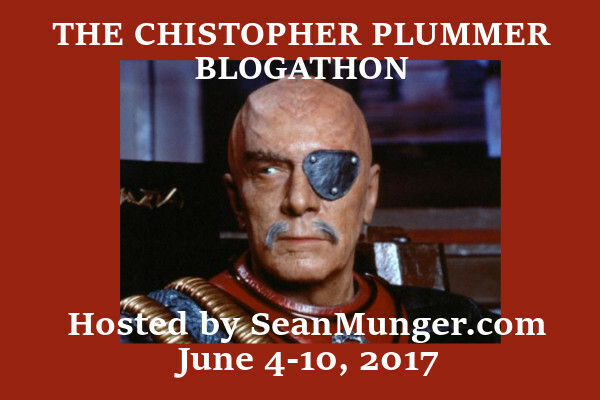 One of my favorite Christopher Plummer movies was I think made for TV. It's The Scarlet and the Black, based on a true story from WWII in which a Nazi officer (Plummer) tries to take down a Catholic Cardinal (Gregory Peck) who is helping the Allies from the safety of the Vatican. Plummer and Peck are both getting on in years in it, but both are superb, as you would expect. It's a great game of cat-and-mouse where the mouse got replaced with another cat. That one is at my library, I think. (at least the title is, it may be a remake. I'll have to look...) Thanks for reading. The one I'm talking about was made in 1983. That's the one they have.